Abstractionist Cemal Gürsel Soyel prefers to be called a painter instead of an artist. He says that he does not have the courage to work with new materials. Acrylics, for example, are a reach for Soyel, whose exhibition "On the Run" will be at C.A.M. Gallery until June 15 to spark that usual flurry of cynicism and awe among first-time viewers and returning followers alike; those drawn to the enigmatic worlds of abstract art in Turkey. In a word, his action-doused gusts of brushstrokes are filled with drama, advancing nameless and original techniques enough to transcend critical attention about his medium. He is a simple oil-on-canvas man, yet his work dreams up figments of hyper-conscious impressionisms to realize some of the complexity of human emotion, and of worldly existence descending from the drips and lathers of colored paint onto a clean, open surface. To a rational thinker, it would appear that only the bravest of poets might have the vocabulary to stir up some verbal justice before his utterly breathtaking, ineffable work. "My paintings are based entirely on spontaneity. Of course this does not mean that I am working unaware. My point is not to express something in my paintings. The important thing for me is that I struggle in front of the canvas and express how I feel in my studio. My feelings in that moment and the situation are first and foremost. 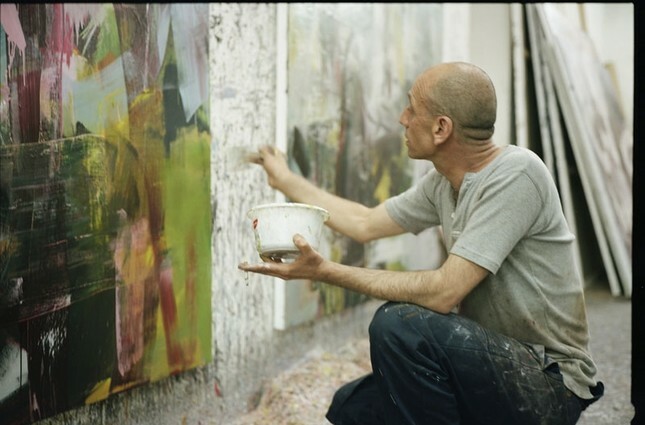 The important thing is to express myself," Soyel wrote in an email to Daily Sabah, recalling his roots as a Cypriot-born artist who has divided his education and career as a painter between Istanbul and Vienna beginning in 1984 with his first group show in Turkey and in 1989 with his first solo show in Austria. "Istanbul is a very important city for me. I was 17 years old when I came from Cyprus to Istanbul to study at Mimar Sinan Fine Arts University. I learned to think and discuss art in this city. Istanbul is an experience for me." "Maybe Istanbul," oil on canvas, 190x140cm, 2016. "On the Run" is Soyel's first solo show at C.A.M. Gallery in Çukurcuma, a neighborhood that has become downtown fashionable in recent years; where Istanbul's art lovers and curious wanderlusts go door to door in and out of overlapping exhibitions between antique shops and stylish cafes. Soyel participated in Contemporary Istanbul with C.A.M. Gallery in 2017 for one of the fair's group shows. The year prior, Soyel worked with Versus Art Project for an exhibition of over 20 of his oil paintings titled, "Get Lost." He remembers it as the first time he had the opportunity to work with "very young people." He felt the positive energy, the fresh enthusiasm. Marcus Graf, the art historian and curator at the leading edge of the Istanbul scene with his new "Sweet Little Lies" exhibition at Plato Sanat, wrote an enduring text about Soyel to coincide with a public discussion that he gave with the artist for the Versus Art Project show. "According to formalists, art is not serving anything or anyone anyway as it contains no messages or stories. That is why they understand art as a self-referential system of codes that is bound to nothing else but art itself. Only then can art and artists be free from all social and contextual boundaries and work in autonomy," wrote Graf, skillfully distilling the aesthetic philosophy at C.A.M. Gallery where the recently exhibited painter Mahmut Celayir also professed that his art is purely visual and does not tell stories; otherwise he would have become a writer. "It is no wonder that every now and then, people link Cemal Gürsel Soyel's work to the school of Tachism... Actually, it makes sense, as he has spent a great part of his life in Vienna, where after being a student of Neşet Günal and Neşe Erdok at the Mimar Sinan Fine Art Academy, he continued his studies at Vienna's Fine Art Academy. There he naturally came in contact with the European school of great abstract painters, so his oeuvre is influenced by a deep insight into the tradition of modern abstraction." Soyel begins a work of art like that of an elder retelling the myth of creation. He first paints the canvas pitch black. In contrast, he frequently chooses a palette defined by white. In that fundamental drama of opposites, his pieces emerge as from the chaos of nothingness, mysteriously guided by reminisces of his childhood in Cyprus, when he often lost his way while growing up on the island. Inside his densely caked and smeared layers of paint are his earliest fears, long suppressed until they emerge under the light of his studio. He is unable to settle down, mentally, emotionally, creatively; it is clear in his non-representational artwork. He searches for a place where he belongs, and finds it in a lack of belonging; so he continues to pursue dedicated motifs through total spontaneous abstraction. "It is difficult to exist in Austrian society as a Turkish artist. There are lots of reasons. It is not my business to talk about that, sociologists should. If I had been a German, Italian or English artist instead of a Turkish one, it would be much easier. The situation has changed. People in Austria who used to come to me with prejudices in the past may even propose to work together now," said Soyel, who speaks with an honesty as uninhibited as the splashes of color that stretch across his canvases like some sprawling, acrobatic posture of a master yogi. "I left Istanbul in 1986. Since 2011, I live both in Istanbul and Vienna. Istanbul is now so different; the art I mean. I like the current Istanbul more in terms of its art scene. There are more galleries, artists and collectors. I know this because I have lived both." "On the Run" will exhibit a number of large canvases on its storied walls, but also smaller pieces that appear almost like sculptural works made of thickening, cresting waves of oil paint, as a still life of the ocean in three dimensions. His use of color is striking in its tension of subtle and overt repetitive patterns. Beyond his principal use of black and white, his reds burst in flashes of metaphor, from opposite sides of the spectrum, clashing in a visual scream of human power coming to a head under greater universal forces, as creation and destruction are personified in a single thrust of direct action. Soyel is expressly influenced by the differences between Istanbul and Vienna, and in the process admires the German painters Georg Baselitz and Albert Oehlen as well as the school of American expressionism. "This exhibition seems like a follow-up of my previous show but it is very different. First, the size and color of my new works are different. There are only oil on canvas paintings in dimensions variable not paper works. The only similar thing is my attitude as an artist. I work spontaneously," said Soyel, who is proud to show at C.A.M., a gallery with a rare, professional reputation as one among only a handful of contemporary art institutions in Istanbul continuously alive and running for over two decades. "There are no artists who inspire me, but there are lots of artists who make me feel excited and who help me to find the way to my studio. I like to paint a lot. That's why I like to call myself a painter instead of an artist. What's the role of the painter in society? It is a question that interests sociologists and philosophers. Maybe I also paint to find the answer to this question."